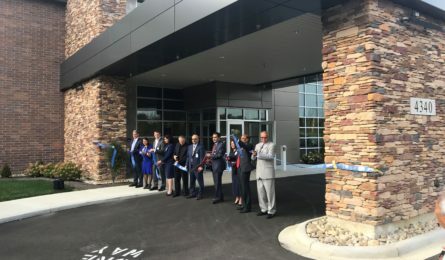 Digestive Specialists, Inc. and Digestive Endoscopy Center, LLC, recently held their grand opening at their Clyo Road location in Dayton, Ohio. MSP provided architecture, engineering, landscape architecture and interior design services to this 27,910 SF newly constructed medical office building. The project scope included site improvements, office building shell, first floor common and mechanical spaces, and a second-floor medical office building. A ambulatory surgery center (ASC) is also located on the first floor. The ASC was designed by an architectural consultant, APP Architecture under the direction of MSP. The second floor medical office building consists of 15 exam rooms, eight doctor’s offices, three nurse stations, motility, Remicade, and support administrative spaces.